Republican National Committee Chairman Reince Priebus, elected to a third term earlier this month, often notes that the presidential cycle is harder for his party than midterms because the electorate is more diverse and Democratic. “For us to win a presidential election, we have to be just about perfect, and the Democrats have to be good,” he told Kyle Cheney of Politico. Priebus’s observation certainly squares with post-2012 commentary arguing Democrats might have an edge in the Electoral College, though like any good coach, the chairman is also trying to guard against overconfidence amongst his fellow Republicans. The coming presidential election will provide an interesting test as to whether Democrats do have a durable Electoral College advantage, particularly if political science forecasting models suggest that the Republican nominee should win the election but he or she fails to do so. That said, Republicans are not without at least one Electoral College edge in 2016. While the Democrat needs 270 electoral votes to win the presidency — a majority of the 538 available — the Republican only needs a 269-269 tie to win. Republicans dominate the states’ individual U.S. House delegations, and there’s no reason to suspect they will lose this advantage in 2016. The GOP holds a majority of the House seats in 33 states, while Democrats only have a majority in 14. The remaining three states — Maine, New Jersey, and New Hampshire — are tied. Map 1 shows the percentage of seats controlled by each party in each state, and Table 1 provides a more detailed, state-by-state breakdown. It’s no shock that the GOP has such a lopsided edge in state U.S. House delegations. After all, the party just won its biggest majority since 1928. But what is striking is that Republicans control the House delegations of nearly every presidential swing state. The states where Democrats hold a majority of House seats all at least lean to the Democrats in presidential elections. Barack Obama easily won all 14 of these states in 2012. Of them, only Minnesota went for Obama by fewer than 10 points, and Mitt Romney never really contested it (Obama won the North Star State by close to eight points). The three states that are tied — Maine, New Hampshire, and New Jersey — have all backed Democratic presidential candidates in at least the last three elections. Of the 33 Republican-controlled delegations, nine of them are in states Obama carried in 2012: Colorado, Florida, Iowa, Michigan, Nevada, Ohio, Pennsylvania, Virginia, and Wisconsin. In many of these states, the Republican House edge is overwhelming. Take the trio of Florida, Ohio, and Virginia, which were Obama’s three closest Electoral College wins in 2012 and are arguably the three most vital swing states in the Electoral College. Republicans have a combined House edge in these states of 37-17. Throw in North Carolina (10-3 Republican), which was Obama’s closest loss, and the edge is 47-20. So in the only four states decided by less than five percentage points in the 2012 election — three won by Obama, one carried by Romney — Republicans control 70% of the House seats. And if you think this is just a function of the recent Republican-dominated midterm, think again: The GOP only netted one extra seat (NC-7) out of these states in 2014. The GOP’s swing state House edge was built in the 2010 midterm, reinforced in decennial redistricting conducted after that election, and solidified in 2012 and 2014. The same is true in other swing states that are traditionally more Democratic, like Michigan (9-5 Republican), Pennsylvania (13-5), and Wisconsin (5-3). The Republicans didn’t net a single extra seat out of these states in 2014. Of the remaining three Obama states with GOP-controlled House delegations, Iowa and Nevada were tied prior to GOP gains in 2014, and Republicans have held a narrow 4-3 edge in Colorado’s delegation since 2010. Just for the sake of argument, I looked at what would happen to the makeup of House delegations if Democrats had an incredibly strong Election Night. Under a very rosy scenario, would Democrats win a majority of House delegations? Let’s say that Democrats in 2016 net even more than the 30 seats they need to flip control of the House: 36, or every single Republican-held seat we currently list as at least hypothetically competitive in our Crystal Ball ratings (in other words, every GOP seat we don’t rate as Safe Republican). Those seats are listed below. Such an improbable victory would give the Democrats a 224-211 House edge: Not a big majority, but a majority nonetheless. And yet, Republicans would still control a bare majority of House delegations and retain tiebreaking power in the Electoral College. Remember, Democrats are starting with 14 delegations. They would gain the three currently tied delegations in Maine, New Hampshire, and New Jersey. That gives them 17, to the Republicans’ 33. Then, Democrats flip seven additional delegations: Alaska, Arizona, Colorado, Iowa, Michigan, Nevada, and Virginia. The Democrats would then control 24 delegations, but the Republicans would still have 26 (there are no tied states assuming these results). In other words, even under a highly implausible pro-Democratic scenario, the party still would lack the votes to win a tied Electoral College. Back to reality, and a vital caveat: A 269-269 tie would mean a very close presidential election nationally. That would rule out the Democrats getting the requisite national wave they would need to capture the House, let alone a majority of House delegations. If the House is in danger of flipping to the Democrats next year, it seems reasonable to assume that the Republican will handily lose the presidential race, rendering this discussion irrelevant. This is all a long way of reiterating that the Republicans’ magic number to win the White House next year is 269, not 270. Granted, this edge is almost certainly not going to matter. In our current Republican vs. Democratic political alignment, which dates back about a century and a half, the House has never decided a presidential election. There have been a few Electoral College misfires in this time: In 1888 and 2000, the winner of the popular vote lost the Electoral College. In 1876, Samuel Tilden (D) won the popular vote over Rutherford B. Hayes (R) and also seemed poised to win the Electoral College, but a dispute over the results led to a deal in which Hayes won in return for an effective end to post-Civil War Reconstruction. In none of these elections did the House have to pick a winner: 1800 and 1824 remain the only elections when the U.S. House selected the president after the Electoral College failed to produce a victor. This map assumes the GOP nominee wins all of the states Mitt Romney carried in 2012 while peeling off four 2012 Obama states: Florida, Iowa, Ohio, and Wisconsin. Imagining the Republican winning Florida and Ohio is easy: Obama won the former by less than a point and the latter by about three points. These were his closest wins. Then we’re giving the GOP nominee Iowa and Wisconsin, two Midwestern swing states that are typically at least slightly more Democratic than the nation as a whole in presidential elections. These are heavily white states, though, and perhaps Democratic performance among working-class whites erodes even further, putting these states more in play for the GOP. This 269-all tie would represent something of a stall for the “emerging Democratic majority” thesis, because Democrats hold swing states with significant minority populations like Colorado, Nevada, and Virginia but can’t get over the finish line because of problems in the whiter Midwest. However, and assuming a relatively uniform vote swing from 2012 to 2016 across the country, one would expect the GOP nominee to win Colorado and Virginia before Iowa and Wisconsin because Romney did better in the former group than the latter in 2012. 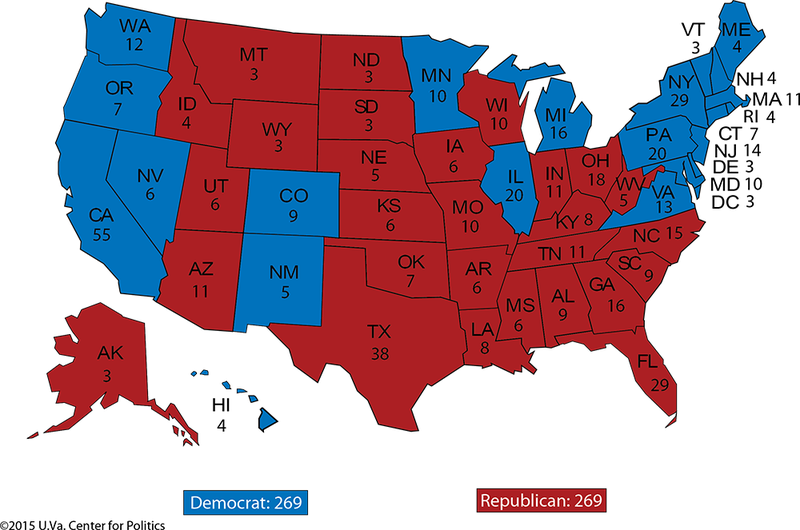 Swapping out Iowa and Wisconsin for Colorado and Virginia on this map would deliver the Republicans an outright win. Overall, an Electoral College tie is not likely. It’s very unlikely. But if a 269-269 split somehow occurs, it would not really be a tie. Rather, after much gnashing of teeth in the House and a national constitutional crash course, it would be a Republican victory.